Have you ever heard of an oral probiotic formula? Hyperbiotics produces them and let me tell you these things are fabulous! If you've ever suffered from a case of bad breath you will wish that you had these. Meet PRO-Dental! 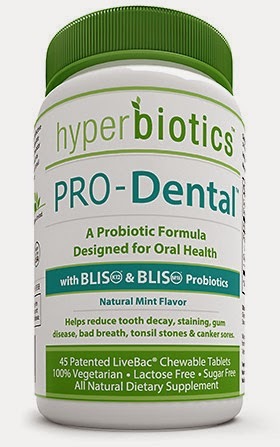 PRO-Dental is brand new concept in the probiotic world as it focuses on repopulating your oral and nasal cavities (as opposed to your GI tract). How cool is that? My family was honored to test out this fabulous new product! If you suffer from recurrent sore throats, allergies, ear or sinus infections or from dental issues such as cavities, plaque, bad breath, teeth staining, gum disease, tonsil stones, or sensitive teeth, I would suggest that you check out this formula. To start off, the taste is a mint flavor that reminds me of a light dinner mint and are easily chewable. My husband and I both tried the tablets as well as shared them with a few friends. Everyone loved them! My husband occasionally gets tonsil stones so he was excited to try this out. The tablets are great for freshening up your breath too. As instructed, you take one after brushing your teeth and it helps your mouth territory turn back into the sweet bliss it's supposed to be in. After visiting the Hyperbiotics website, I was blown away with what the company is doing to help people out. Their mission page is worth a read for sure. They've helped out 60 women in the last 5 months with gentle births along with another 50 expecting Moms with prenatal care. They say gut health begins at birth and are on a mission to educate others and to support the movement that leads us back to living life as nature intended. Not only do they have this oral formula, they have other blends for your GI tract. This video below goes into more detail about the offerings and what the GI tract formulas help with. Do you take any type of probiotics or if you're a parent, do you give them to your children? P.S. a BIG thank you to Hyperbiotics for the sample!